Residencial das Araras Hostel in Porto Seguro, Is proud to announce, it's Special Events Page!! 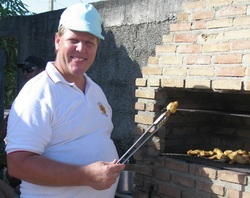 Paul at the Grill, BBQ Wings anyone? Paul has been an international traveler since the 80's, His adventures of being a backpacker, who hitchhiked the California coastline in the mid 80's, working as a missionary in South Korea, as well as his recent adventures in moving permanently from America to Brazil, knows what's going on in the world of international travel and backpacking from experience! Paul Knows you want to "hook up" with the best party scenes and events, and will do his best to see that you DO! Residencial das Araras has the most international clients in Porto Seguro, which makes our hostel an interesting and fun place. Meet fellow world travelers and share your experiences together by the poolside or at the outdoor bar. Whether you "hang out" or "go out", Residencial das Arara's is your homebase, An oasis of peace and tranquility. We are located close enough to the best parties, but just far away enough to ensure that your tired brain cells can get the rest and relaxation they need! Look what Magdelena from Chile said about Residencial Das Araras Hostel! Click Here To Book Your Reservation Online!